This issue of Constellis’ Kidnap for Ransom Insight Report covers global kidnapping incidents and trends for the months of September, October, and November 2018. 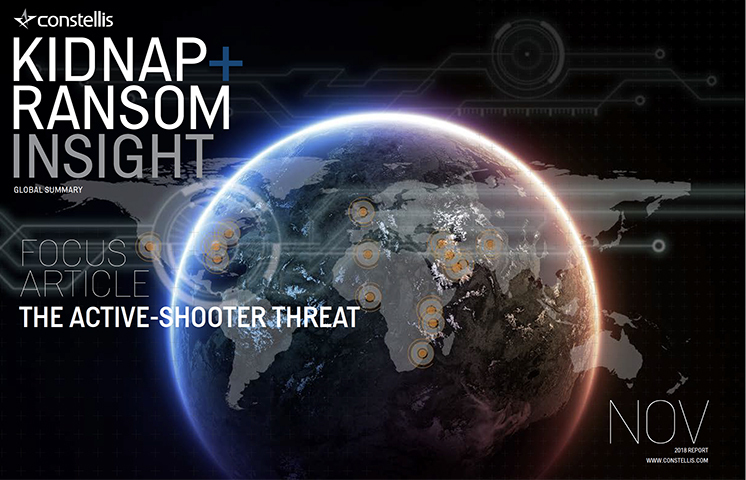 The information is derived from multi-source analysis of kidnap for ransom activity and where known, the outcome or resolution of the event. The report covers current kidnap for ransom hotspots at regional, national and provincial levels, with particular focus on areas where K&R activity is increasing. Statistical analysis of data for September and October 2018 is included on page13, which displays K&R trends by region, victims by nationality and employment sector, as well as identifying the Top 10 countries for kidnapping of foreign nationals over the reporting period. The Global Piracy Update provides an overview of the piracy threat by region, providing trend analysis for September and October 2018. It also includes sample cases occurring through those months, providing an illustration of the identified trends. The Cyber Security section examines current issues affecting companies and individuals in the realm of IT security. This edition will look at the threats against ‘Internet of Things’ (IoT) devices. The use of IoT, or ‘smart devices’, has become increasingly common among individual users as well as in the workplace. As projections establish that tens of billions of IoT devices will be in use globally in the next couple of years, it is widely acknowledged that IoT security has not kept pace with the proliferation of these devices. A vast number of vulnerabilities have been exposed by cyber criminals, often having a significant impact on businesses and governments. With the abundance of data being collected by IoT devices, both for personal or professional use, users and organizations are becoming increasingly susceptible to data interception, which can have a significant financial impact, as well as placing individuals at physical risk. The Focus Article offers an insight onto the Active Shooter threat. Mass shootings and workplace violence events are on the rise, with such incidents reported around the world on a nearly weekly basis. This is particularly the case for countries where guns are largely accessible, including the US, where this type of event is becoming a significant risk for organizations. In this context, and given the impossibility of predicting when or if an active shooter will target an organization, emergency action plans and pre-incident training are essential, in order to enable personnel to react appropriately if confronted with an active shooter situation.